Learn the ABC's of stock market investing including how to do your own stock investment research. Smartphones are getting more efficient and powerful at doing things. Several financial firms and brokerage services are taking cognizance of this trend and are offering tools and platforms that can be accessed and worked with on a mobile device. However, not all mobile devices and apps are equally proficient at getting the job done, and have not yet been able to replace the PC. The following are some of the apps that would make trading on-the-go much more efficient or take your investing game to another level. By the way, there’s no dedicated smartphone or tablet PC for stock trading. Almost all phones that have access to the following apps would suffice. But if you’d like to have a seamless trading experience, it’s recommended you buy a more capable or the latest device such as the Galaxy S7 or the S8 by Samsung, and other high-end Android phones sold by LG, HTC, Sony, and the likes. Now, let’s get to the apps. Robinhood is a financial app that lets investors trade stocks sans any commission fee. The app is fairly basic in functionality and seasoned investors may not derive much value from it. 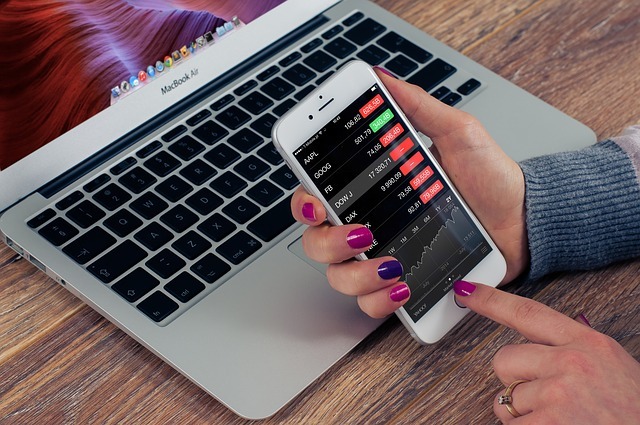 But if you’re a newbie who has just started trading stocks and would like to take your investing game to another level, this app should provide you everything you need. The app was launched in 2014 and within a year, it managed to win an award for design, which is a first for a financial app. The simple interface and short sign-up process helped the app win the prestigious recognition. The app incorporates geolocation to recommend relevant stocks. It offers an innovative social, crowd-sourced approach that shares industry trends and insights from other people using the Robinhood app. The app is available on both Android and iOS and has been earning rave reviews from users. In 2016, the makers announced Robinhood Gold – a version that’s equipped with premium attributes, such as line of credit, extended trading hours, and a quicker option to make withdrawals and deposits. The advanced version would, however, cost $10 per month. Stocktouch is a financial app that’s more of an informative platform letting users monitor the trading market real time. The stocks can be alphabetically sorted, and also by market capitalization, size, volume, and percentage gains. Detailed information pertaining to a specific stock and its past performance could be obtained by zooming in on the stock or through touch gestures. Colored heat maps help track the ups and downs in the market. Unfortunately though, the app is available only for iPhone users. Tradehero is another informative app but it also lets users carry out simulative trading in a secure and safe environment. Using real-world information, TradeHero is ideal for people who would like to hone their trading skills or test out new strategies before implementing them in real stock exchanges. Users are provided $100,000 to create their fictional portfolios and battle it out against other users of the app. Winners’ names are mentioned on the leaderboard, along with the chance to win real money as cash prize. Participants get alerts relating to their favorite stocks’ performance and also have access to tips and video tutorials from experienced users. Acorns is a fairly unique stock trading app that lets users invest money in the stock exchange in small increments over a time period. The basic setup is fairly straightforward. It takes spare money from your daily transactions and invests that cash into different markets and businesses so that your investments are diversified and your chances of making money increase. For instance, if you spend $12.50 on a certain purchase, the app would round that figure to $13 to lap up the other $0.50 for investment. Such investment could be fun and a less risky way to dabble into the world of stock markets. For beginners, Acorns is ideal. Portfolio Watcher, as the name suggests, helps you keep a tab on your trading activities and also learn market information. You may tap on a particular app to view news, charts, and several other information, which includes the highs and lows of the day, EPS estimates, P/E, short ratio, bid size, annual price target, etc. The app can be synced with your existing Google or Yahoo-based portfolio set up as well. For stock news, you can hit the News tab for relevant news from CNBC, Reuters, Business Insider, etc.